Kyrgyzstan's ousted president, Kurmanbek Bakiyev, has left the country. According to the interim government, the original of his letter of resignation was delivered to Kyrgyzstan on Friday. Earlier, the president’s closest supporters denied Bakiyev’s resignation. However, a spokesperson for the interim government stated that the letter was delivered Friday morning by a special messenger at the OSCE in Bishkek, Kyrgyzstan’s capital. “I resign, in accordance with Article 50 of the Constitution of the Republic of Kyrgyzstan, fully realizing the responsibility for the future of the Kyrgyz people, the preservation of statehood and the Kyrgyz nationality, during these tragic days,” Bakiyev’s letter read. 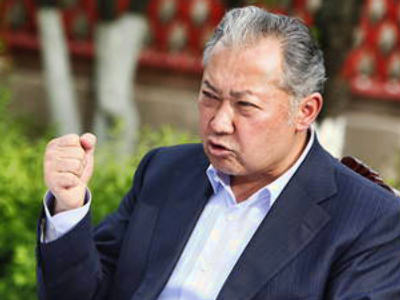 Bakiyev left Kyrgyzstan on Thursday, following permission from the interim government. He arrived at Kazakhstan’s Taraz airport on Thursday. Reports have been circulating that Bakiyev was soon planning to relocate again, but there has been no official confirmation. In the meantime, the Kyrgyz authorities are continuing the search for the deposed president’s relatives. The interim government has promised the people of Kyrgyzstan to bring to justice Bakiyev’s brother, who was in charge of state security forces that opened fire on anti-government demonstrators, and Bakiyev’s son, who has been accused of misappropriating government funds. Kurmanbek Bakiyev has left Kyrgyz territory as a result of an agreement between the presidents of Kazakhstan, Russia, US and a number of international organizations, announced Kazakh Foreign Minister and Chairman of the Organization of Security and Cooperation in Europe Kanat Saudabayev. “On April 15, as a result of common efforts of Kazakh President Nursultan Nazarbayev, US President Barack Obama, Russian President Dmitry Medvedev and active mediation of the OSCE an agreement has been achieved between the interim government of Kyrgyzstan and president Kurmanbek Bakiyev about the latter’s departure from the country,” reads the statement by OSCE chairman Kanat Saudabayev. 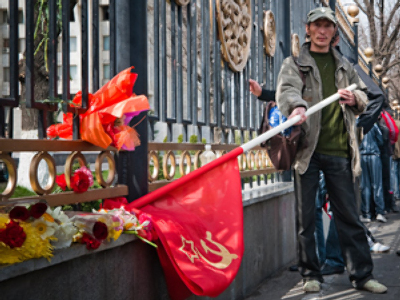 “This is a really dramatic situation for Kyrgyzstan because we have seen it all before. And it is not because someone wants a revolution, but because the Kyrgyz people have not been satisfied with their lives for the past few years. Unfortunately Bakiyev could not solve the country’s social and economic problems,” Medvedev said. “Moreover, the collapse of the existing political system happened because he has not solved these problems – and his regime was based on nepotism,” he added. On Thursday, Russia’s president discussed the situation in Kyrgyzstan in a phone call with his Kazakh counterpart, Nursultan Nazarbaev, said Medvedev’s press-secretary. “Nazarbaev has informed Medvedev about Kazakhstan’s efforts to regulate the situation in Kyrgyzstan and about his contacts with representatives of the interim government,” the spokesperson added. “Medvedev has instructed the Russian Defense Ministry to guarantee a safe flight to Kazakhstan for ousted President Bakiyev with his family,” she said. Russian President Dmitry Medvedev has also said that future relations between Russia and Kyrgyzstan will depend on the true will of the Kyrgyz people and ability of the current government to maintain order and security as well as to address urgent social and economic issues, according to the President’s press secretary, Natalia Timakova. Medvedev added that much will depend on whether the interim government will be able to hold open and just elections. Earlier on Thursday, Bakiyev informed his supporters that Kazakh president Nursultan Nazarbayev has invited him to talk about regulating of the situation in Kyrgyzstan. Before he left, Bakiyev met with his followers in his father’s house in a suburb of Dzhalal-Abad. Some 500 people were outraged by the news of his departure and did not want to let Bakiyev go, RIA Novosti reports. People yelled that if anything happens to Bakiyev, there will be a lot of blood, according to RIA Novosti. 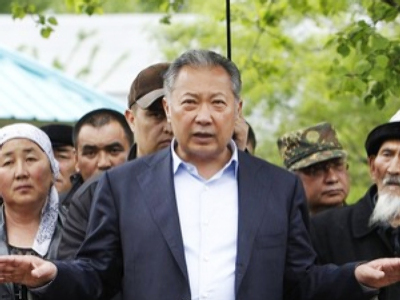 Bakiyev’s supporters have promised to meet him back in Dzhalal-Abad. 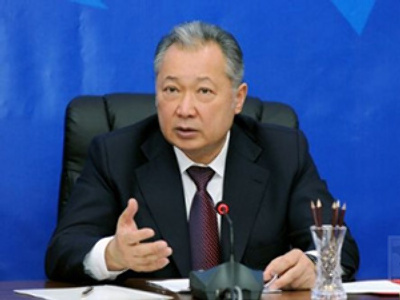 Kurmanbek Bakiyev has run out of time, declared the leader of the interim government Rosa Otunbayeva on Thursday. “We are not accepting any conditions from [Bakiyev], except for providing security,” she emphasized. Asher Pirt, an expert on Central Asian affairs, says ousted President Bakiyev is likely afraid that he may face trial on corruption charges. Andrew Osborn, the Daily Telegraph's Moscow bureau chief says that most probably big powers pressed or convinced Bakiyev to leave the country. “The big powers have an interest in his country. Namely Russia, the United States and China, I think were all involved behind the scenes in this. And I think that their role was really crucial in persuading [Kurmanbek Bakiyev] to leave peacefully. So it was their pressure that really [took a toll] on him and he simply realized that the game was up,” Osborn believes. 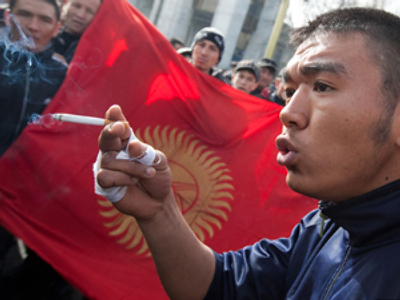 A former OSCE election observer in Kyrgyzstan, Andy McEntee, sees the roots of the Kyrgyz uprising in the 2009 election. Journalist Sergey Strokan from the Kommersant newspaper praised Moscow’s position on the Kyrgyz issue. Aleksandr Knyazev, director of the Commonwealth of Independent States Institute in Bishkek, says the interim government needs to bring the ousted President to trial in order to win public support. Lilit Gevorgyan from IHS Global Insight believes there are quite a number of things that the new government has to tackle. Restoring normality in Kyrgyzstan will not be an easy process, believes Evgeny Volk from the Yeltsin Fund – the political system is corrupt all through. “Of course, the new government will put its people to key posts, the people who worked with Bakiyev will be dismissed,” the political analyst said.